Are you looking for a speaker who will adapt to meet the needs of your specific audience? Brenda has presented to a wide range of people on five continents. Her energetic talks incorporate her FLAG philosophy – Fun, Leadership, And (continuous improvement), Growth. Following on from a keynote presentations at a PWC Women’s Breakfast in August 2010, Brenda received this letter in May 2014 from one of the attendees. 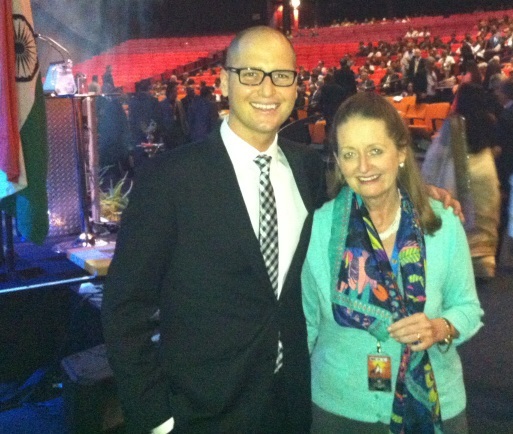 Michael McQueen and Brenda Eckstein, speakers at the TAFI convention in South Africa. What is your envisioned personal (or organisational) destination within a specific time-frame? How do you, as captain of the ship, simultaneously ‘keep the boat afloat’ while meeting the needs of the vision, team and individuals? How do you harness the power of collective networking while motivating and empowering members of the team? To read a post on this keynote please click here. This is an example of a keynote developed for a specific audience on a special occasion. To read a post on this keynote please click here. Break down barriers and limiting beliefs. Don’t put yourself in ‘little boxes’. Be your authentic self. It doesn’t matter if you seem eccentric. Have your own unique, dynamic personal strategy in place. But keep your blinkers off so you recognise and optimise opportunities. Validating others empowers them and enhances our leadership capabilities. What self-perpetuating stories are we telling ourselves? Continuously improve our personal and business product, service and the way we operate. Shine up the people (leadership – self and others). Scrape away the barnacles – regularly reassess and modify to get rid of (metaphoric) ‘excess baggage’. Become the person of choice, business of choice or organisation of choice through building and fostering positive relationships. Develop your skills and build your networks simultaneously. Turn challenges into opportunities – for yourself, your team, your organisation. Sometimes we need aspirin – sometimes we need to go much deeper. Draw on your resources (internal, external including supporters). The importance of personal strategy – and tactics. ‘The little engine that could’.